The Argentinian GM Federico Perez Ponsa beat a daunting field Thursday to earn his way into the Bullet Chess Championship main bracket. In a tournament that included Maxime Vachier-Lagrave, the newly-crowned European champion Vladislav Artemiev, the experienced online player Daniel Naroditsky and yesterday's winner Alireza Firouzja, Perez Ponsa kept his composure and finished with a cool 19/25, edging out Vladimir Fedoseev on tiebreak. You can find more information on the Bullet Chess Championship here. Perez Ponsa (@Genghis_K) came out of the gates red hot, going 11.5/12 to start the tournament and opening up a two-point lead during that time. He will now join the elite company awaiting him in the 2019 Bullet Chess Championship main bracket and will face world number-eight Vachier-Lagrave in the first round of the competition on April 6 at 10 a.m. Pacific time (18:00 Central Europe). These matches will be shown live at www.Twitch.tv/Chess and www.Chess.com/TV. Perez Ponsa faced an incredibly tough field in front of 6,500 Twitch viewers to claim his spot in the 2019 Bullet Chess Championship. 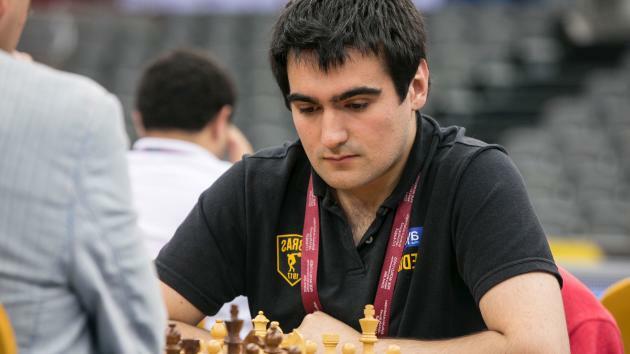 The second Swiss qualifier went down to the wire, with Fedoseev leading the pack for the final four rounds of play until dropping his final-round game, allowing Perez Ponsa to leapfrog him in the standings. Perez Ponsa got a critical decision against the former world junior champion and one of the strongest players in the field, Jeffery Xiong. Winning entries into Friday's round-robin qualifier were Fedoseev, Naroditsky and Salem Saleh, who finished in second, fourth and fifth places respectively. They will join Andrew Tang, Jan-Krzysztof Duda and Georg Meier along with wildcard invites Oleksandr Bortnyk, Jon Ludvig Hammer, Ian Nepomniachtchi and Eric Hansen in a star-studded round-robin qualifier. The winner of tomorrow's round-robin qualifier player will join Perez Ponsa and Firouzja in the main bracket after battling it out on Friday, April 5 at 10 a.m. Pacific time (18:00 CET). You can find the results of all games from the second Swiss qualifier here. During the tournament, Perez Ponsa met his future opponent Vachier-Lagrave in an exciting mid-round encounter that saw the two highly-skilled players settle for a draw. Perez Ponsa shouldn't feel pessimistic regarding his chances versus the French number one as their head-to-head record currently stands at four wins for Perez Ponsa to seven wins for Vachier-Lagrave, with two draws. Perez Ponsa will have world number-eight Maxime Vachier-Lagrave waiting for him in the first round of the Bullet Chess Championship. | Photo: Maria Emelianova/Chess.com. With a spot in the championship booked, Perez Ponsa's task now gets tougher in the main bracket where he could face the likes of Hikaru Nakamura and Alexander Grischuk. This relative unknown will have his eyes set on shocking the world in this year's Bullet Chess Championship. Action continues Friday, April 5 at 10 a.m. Pacific time (18:00 Central Europe) with the round-robin qualifier. Tune in for another exciting tournament at www.Twitch.tv/Chess and www.Chess.com/TV.